P.S. : Copy & Paste the link please if it doesn't show as link, Thank you. 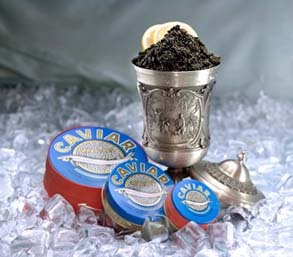 Caviar perhaps there is no food item in the whole surrounded with such special spirit of reverence, mystery and enigma. "Rightfully labeled as black gold" it consistently attracts the eye and palate of society elites not only as delicacy with unmatched flavor but mainly as a symbol of prosperity, luxury and wealth. Traditionally it has been an indispensable accessory to upper class dinners celebrations. 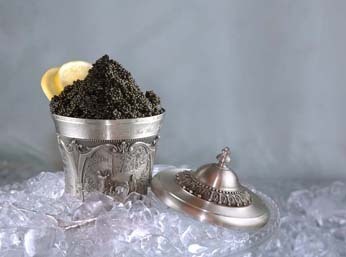 Indeed, there is nothing more exquisite and mesmerizing in a party table then a heaped tin of caviar resting over ice on top of shining sterling silver bowl. 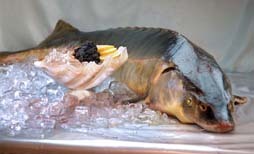 Genuine caviar made out of sturgeon roe. Sturgeon represents a family of ancient chondrostean fish involved around 200 million years ago at the same time as dinosaurs roamed the surface of the Earth. Sturgeon fish are wonderful creatures unlike any other fish species. They may live over 100 years and may reach a weight of over a ton. Most commercially important species of sturgeon inhabit the Caspian Sea, where they have to grow for many long years before they reach maturity and develop the roe.